or composition analysis, and simultaneously propelling an interplanetary spacecraft. Two California scientists are unveiling their proposal for a system that could eliminate an asteroid threat. As an asteroid roughly half as large as a football field — and with energy equal to a large hydrogen bomb — readies for a fly-by of Earth on Friday, two California scientists are unveiling their proposal for a system that could eliminate a threat of this size in an hour. The same system could destroy asteroids 10 times larger than the one known as 2012 DA14 in about a year, with evaporation starting at a distance as far away as the Sun. UC Santa Barbara physicist and professor Philip M. Lubin, and Gary B. Hughes, a researcher and professor from California Polytechnic State University, San Luis Obispo, conceived DE-STAR, or Directed Energy Solar Targeting of Asteroids and exploRation, as a realistic means of mitigating potential threats posed to the Earth by asteroids and comets. 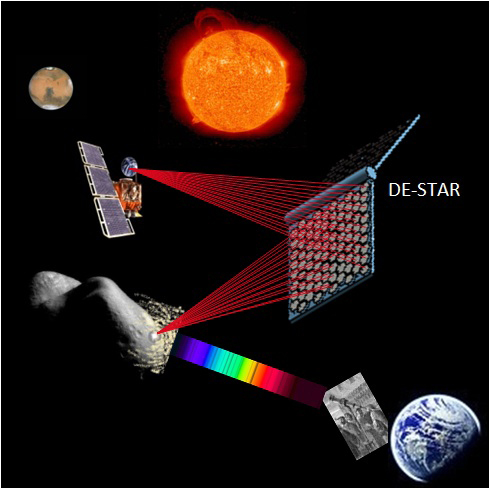 Described as a “directed energy orbital defense system,” DE-STAR is designed to harness some of the power of the Sun and convert it into a massive phased array of laser beams that can destroy, or evaporate, asteroids posing a potential threat to Earth. It is equally capable of changing an asteroid’s orbit — deflecting it away from Earth, or into the Sun — and may also prove to be a valuable tool for assessing an asteroid’s composition, enabling lucrative, rare-element mining. And it’s entirely based on current essential technology. Read more: California scientists propose system to vaporize asteroids that threaten Earth | Science Wire | EarthSky.